In a few days, Volkswagen India will add a new variant to all the models in their line-up  the Highline Plus. The biggest change that the new variant will give to the Volkswagen Polo, Vento and Ameo are the LED headlights with DRLs we saw on the Volkswagen Vento at the 2016 Auto Expo. The variant is also expected to get a fresh set of alloy wheels. While the Highline Plus trim will give the Polo and Vento a reverse camera too, the Volkswagen Ameo's Highline trim already offers this feature. The Highline Plus variant will be available with all the engine and transmission options  the 1.6-litre naturally aspirated petrol, the 1.2-litre TSI and the 1.5-litre turbodiesel with the manual or DSG. The prices for the Highline Plus trims on all models are expected to be around Rs 70,000 more than the Highline variant. This update comes just in time for the Vento, as the launch of the facelifted Honda City is just around the corner. 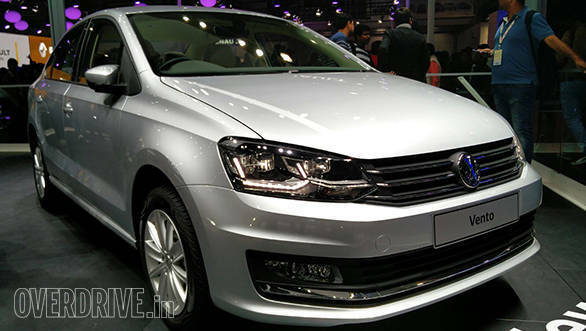 VW had recently updated the Vento with a more powerful diesel engine and with added features in the cabin. This includes a touchscreen infotainment system along with MirrorLink which simulates the smartphone's screen onto the car's multimedia screen. The Vento is expected to receive a few more updates before it will be replaced with an all-new model within two years.